Thinking of Installing a Whirlybird? Why Would You? The Solar Whiz roof ventilation unit allows the solar roof ventilation alternative to provide an array of benefits to homes which require roof ventilation. Seeing as this whirlybird alternative is 10-30 times more powerful than your regular roof whirlybirds, there’s no doubt the capacity the Solar Whiz yields will give your home the ventilation it needs. 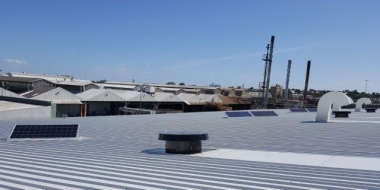 Between the performance and capacity of the Solar Whiz roof ventilation unit, there’s no doubt that the value for money proposition makes the decision simple and easy. Why would you spend money the cheap whirlybird price if it has less air flow? The everyday approach to incorporate a successful roof ventilation solution into your home is installing a whirlybird vent. These are commonly referred to as roof vents, whirly gigs, air vents, roof ventilators, roof exhaust vent, roof fan, roof turbine ventilator, roof extractor fans, whirlybird or simply a ventilator. For a serious and successful solution which you will see reflected by the results the Solar Whiz produces, your best option would be to install a Solar Whiz unit. 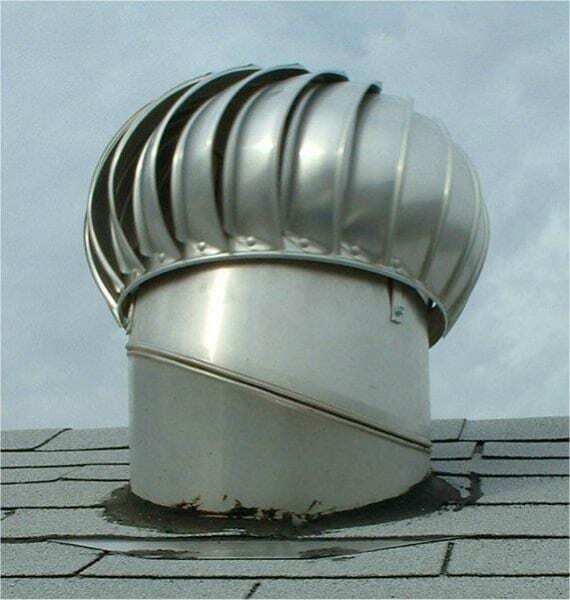 The roof ventilation product (whirlybird) has been around for a long time, however, it’s limited ability to move air out of the roof space, has, over the last decade or two seen more people looking for more powerful alternatives for increased efficiency. The Solar Whiz roof ventilator sometimes referred to as a solar whirlybird, takes roof ventilation/attic ventilation to a new level. Not only does the product range offer significantly higher airflow capacity than most powered roof fans available – it is also solely solar powered and controlled – which means that it runs – when required (i.e. when the sun is out) ensuring the roof is cooled by extracting hot air from the roof space at a much higher rate (10-30 times) than a whirlybird roof vent style unit. 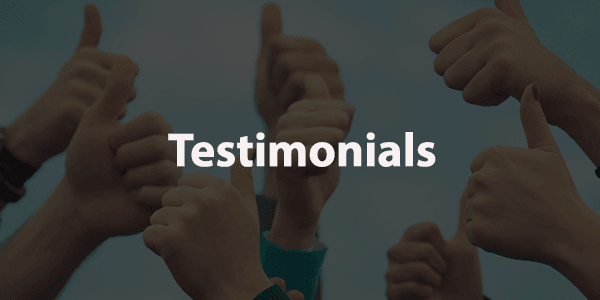 Testimonial – Read what Greg Savill says about Solar Whiz. As I have a split level house, with four levels and cathedral ceilings, I opted for the largest unit the SW3000, with a night control option and an adjustable thermostat.After installing the unit in the main lounge room myself (took approx 2hrs), I then removed the existing whirlybird and placed the Solar Whiz above the exhaust fan in the bathroom. The unit started running immediately after removing it from the box and I could feel the air being pulled already! The Solar Whiz has now been in for about six months and the temperature difference we have noticed is amazing! On hot days the temperature is about seven degrees cooler upstairs and dramatically cooler downstairs. If I close all the openings in the house and open one window down stairs, I can feel the air being pulled through the window and up the stairs to the top floor. I have also noticed that there is minimal condensation on the windows since the installation. Also, the odours previously in the house do not hang around anymore and if we burn something in the kitchen the smell is gone within the hour! The night operation unit is a fantastic added extra as it allows us to pull cool air in at the night and we simply just set the adjustable thermostat and go to bed. We do also have an excising air-conditioning unit and ceiling fans in the house, but rarely use it now opting just for the fans and the Solar Whiz. However, on the odd occasion that we do use the air conditioner, it does not have to work nearly as hard to cool the house as it did without the Solar Whiz. 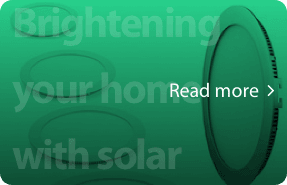 The Solar Whiz is a great product and the team at GES have been so helpful and great at answering all my queries”. 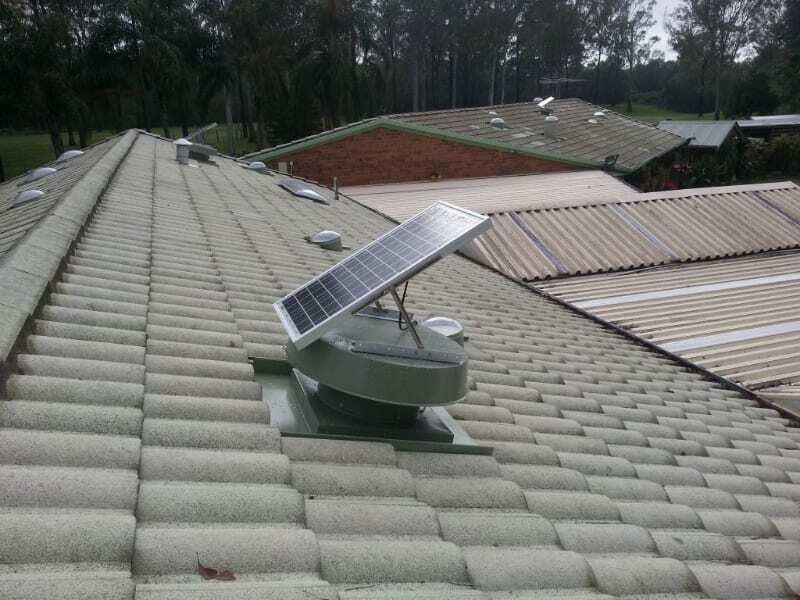 If you need roof ventilation to protect your roof space against moisture damage – running on solar helps ensure replacement air is relatively dry – where as a wind driven roof fan also will run in the rain, which could have the reverse effect and actually increase moisture levels in the roof. 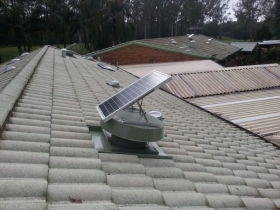 Of course Solar Whiz offers an option to allow ventilation of the roof cavity to continue after sunset, however, most of the job is done during the day. 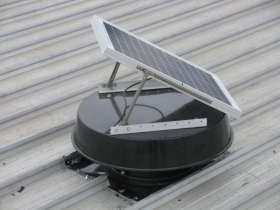 During the day, Solar Whiz roof ventilation units prevent heat from building up – whereas the whirlybird roof vent style fan relies on the wind – or the build up of heat in the roof space to start operating. Few realize that the whirlybird roof ventilator relies on the expansion of the air in the roof space – triggered by high temperatures to start running. Why does the airflow differ so much between roof ventilators? Studies reviewing the performance of whirlybird roof vents been carried out showing that the average wind driven roof ventilator moves about 100 cbm/h – a small fraction of the air moved by even the smallest Solar Whiz unit. 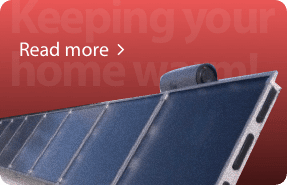 In 2015 Solar Whiz introduced our new RAF range of roof ventilators. We broke with a long tradition in the industry, which conventionally has informed only the theoretical capacity of roof ventilators. RAF is short for Real Air Flow – so when you are looking at buying a Solar Whiz unit – the airflow capacity stated is the actual maximum airflow the unit is capable of delivering. At first sight it may appear as if the RAF models offer a lower airflow when compared to our old range. However, we have simply taken a more realistic and useful approach to inform our customers about the airflow capacity of our products. The actual airflow capacity is based on the airflow with the restrictions an actual unit would have (such as the cap on the unit) when placed on a roof with sufficient replacement air available. Most roof ventilation brands state their fans theoretical capacity with no restrictions (eg. the cap to the unit which is necessary for the ventilator to function) and not the whole roof ventilator unit’s capacity. This obviously gives a higher reading, but is not-applicable in the reality of the airflow capacity. Make sure you check what the actual airflow capacity is with the roof ventilation competition before you make your decision! As you can see from above diagram – one whirlybird has a capacity of around 100 cbm/h without resistance (zero pressure differential). To achieve effective roof ventilation – you must replace the air in the roof space 3/5 times an hour. This requires well distributed access points for replacement air (e.g. eave vents) as well as a roof ventilator with sufficient capacity to compensate for the resistance the entry points and obstructions in the roof create for the replacement air, when the roof fan extracts the hot air. One or two whirly bird style roof ventilators will very rarely get you anywhere near the outside ambient temperature – as the capacity simply does not allow sufficient airflow through the roof. 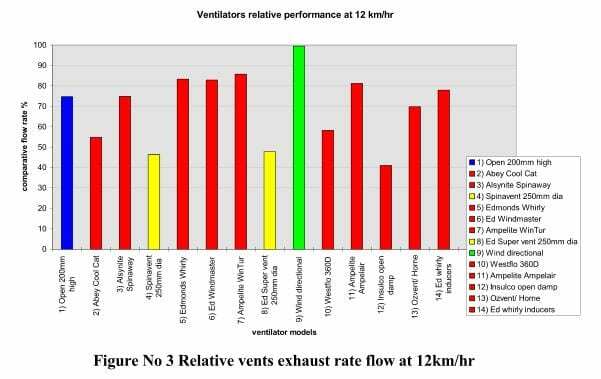 The roof ventilation capacity from the whirlybirds review clearly shows that a whirlybird roof ventilator is not an effective approach to roof ventilation! Whirlybird installation – is very similar to installing a Solar Whiz – and many of our dealers actually prefer to install the Solar Whiz – as it, unlike the whirlybird roof ventilator, does not require to be level adjusted for longevity – as the double shielded ball bearings and high quality brush-less fan motor ensures incredibly low noise levels as well as durability. 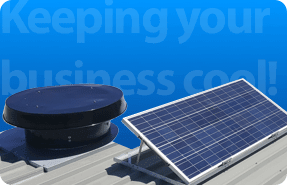 As the installation time and cost is similar for wind ventilators and Solar Whiz units – you will quickly find yourself ahead both performance and cost wise, when installing a Solar Whiz roof ventilation system. Whirlybird price is no longer a major consideration – even though the price for one whirly vent is low – the total amount invested when installing whirlybirds in order to achieve adequate roof ventilation is higher for a whirlybirds based solution. Printable instructions are available for Tin roof Installations or tile roof installations. 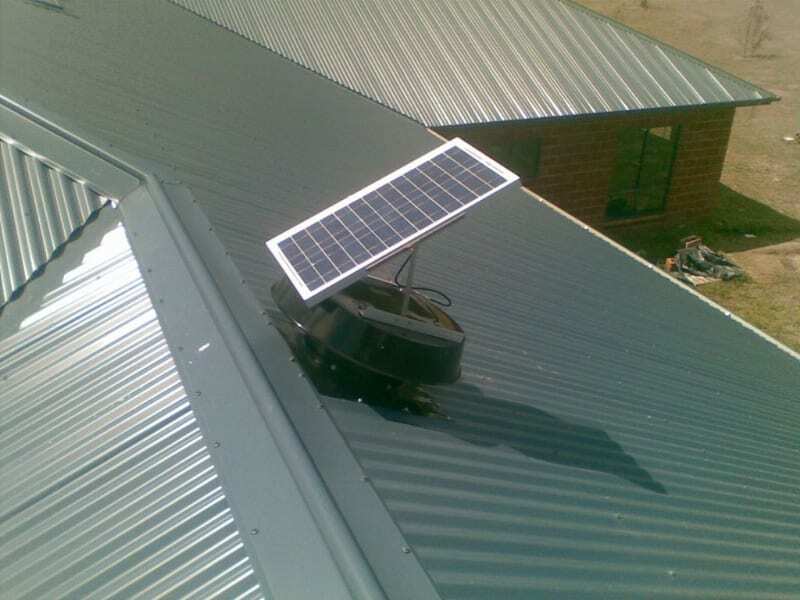 Every new or old roof should be fitted with a Solar Whiz roof ventilator to allow for better air conditioning performance with reduced running time – as well as increased performance – whilst enjoying lower cooling cost when ventilating homes, offices, day care institutions, factories and warehouses. If you are having work done on your roof or in your attic – make sure you replace your whirlybird wind driven roof ventilator with a Solar Whiz to ensure optimum roof ventilation performance to increase your comfort and save on your cooling cost – at the same time! Solar Whiz roof ventilation installation is as easy as a whirlybirds installation to organise (or DIY) in any major city in Australia. 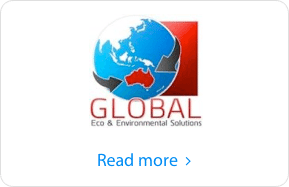 We also cover many regional centers around Australia. 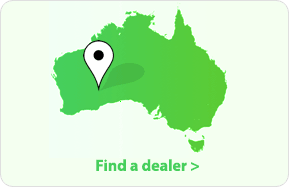 Please refer to our dealer overview. 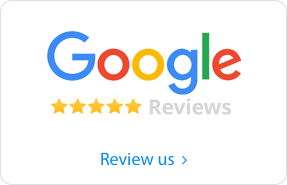 We have very detailed DIY instructions – or any roofing contractor, who does Whirlybird Installations will be able to install a Solar Whiz roof ventilation unit for you. What about Ventilation for Commercial Properties? and the SW-RAF10000, capable of moving a whopping 10,000 m3/h! If you’re thinking of buying cheap whirlybirds to help ventilate your business, consider a Solar Whiz instead! You’ll be feeling the difference during those hot summer days. Contact Solar Whiz for an alternative whirlybird price today!